Combine the milk chocolate and cream in a large heatproof bowl over a saucepan of barely simmering water and stir until melted and smooth. Remove bowl from the saucepan and set a strainer on top. Warm milk, sugar and salt in a medium saucepan. In a separate medium bowl, whisk together the egg yolks. Slowly pour the hot mixture over the yolks, whisking constantly. Scrape the mixture back to the saucepan and cook over medium heat, stirring constantly, until mixture thickens and coats the back of a spoon. Pour the custard through the strainer onto the milk chocolate cream, add the Cognac and mix. Cool completely, stirring occasionally, over an ice bath. Refrigerate, covered, at least 6 hours. Freeze custard in ice cream maker. While ice cream is freezing, melt the dark chocolate in a clean metal bowl set over a saucepan of barely simmering water, stirring frequently, In the last minutes of churning, carefully pour the melted chocolate in a slow stream directly onto ice cream as it churns and continue to churn 30 seconds (chocolate will harden in streaks). Transfer ice cream to an airtight container and put in freezer until firm, at least 4 hours. Wow Nice recepie, I must really buy that book! Thank u for sharing and have wonderfull magic weekend. I'm already missing our chilly days--and craving ice cream every day now! This one looks fantastic. Stracciatella is one of my favorites - your ice cream looks scrumptious! It looks as you say good enough to eat on a chilly day!!! Delicious!!! 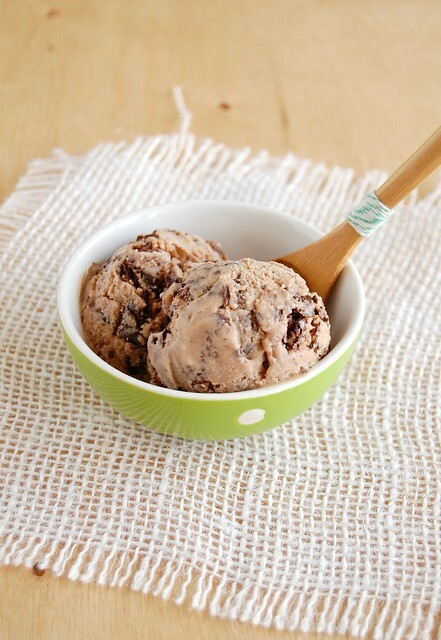 Chocolate and cognac in ice cream is just perfect! This looks absolutely Heavenly! Yum!